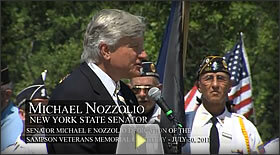 NYS Senator Michael Nozzolio attended the SVMC dedication ceremony at the cemetery on July 30, 2011. Below are two videos taken from the event. Music Director Andy Stobie, a popular local musician with a unique personal connection to the former Sampson Naval Base, will lead the two dozen members Seneca Falls Community Band as they perform at the dedication of the Sampson Veterans Memorial Cemetery on July 30th. Mr. Stobie's father, Andrew Wemyss Stobie, was a U.S. Navy veteran who served in World War II and received his basic training at the Sampson Naval Base, where the cemetery is now located. Andrew Stobie served as a gunner's mate in chargof four machine gun nests aboard the U.S.S. Crowley. He fought in nearly every major campaign in the Pacific Theatre during the War and remained stationed in occupied Tokyo after the U.S. victory over Japan. In addition, musician Jack Jacob Jarosinski will perform a special bagpipe salute to our veterans and play "Amazing Grace" at the close of the dedication. The National Anthem will be sung by soloist Leigh Consolie of Geneva. "It is an honor that so many remarkable local musicians have come forward and contributed their talents to make this momentous day for our servicemen and women even more memorable," said Senator Nozzolio. " I thank Andy Stobie and the entire Seneca Falls Community Band, Jack Jarosinski, and Leigh Consolie for helping us pay tribute to those who served our Nation with courage, honor and dignity." season of performing concerts throughout the Finger Lakes Region. Jack Jarosinski of Ontario, New York, who will play bagpipes during the ceremony, also has deep roots in the Finger Lakes Region and a special commitment to our veterans. His brother, William Jarosinski, was a veteran of the Army who served in the Vietnam War and was awarded three Purple Heart medals for injuries he sustained while fighting to defend our Nation. After William Jarosinski passed away last year, Jack continues to honor the memory of his brother by playing bagpipes at military funerals and other events commemorating the service and sacrifice of our veterans. Vocalist Leigh Consolie of Geneva, who will be singing the National Anthem at the dedication ceremony, also has a family tradition of proud service to our Nation. Her father, Joseph Augustine, served in the Army during the time of World War II. An accomplished performer, Leigh has been the honorary soloist for the Geneva Red Wings baseball team and the Williamson Cubs in Pennsylvania for years. The dedication ceremony will take place on Saturday, July 30th at 11:00 a.m. at the Sampson Veterans Memorial Cemetery, just south of Sampson State Park along Route 96A in Romulus. That portion of Route 96A has been officially renamed the "Sampson Veterans Memorial Highway" to further memorialize all veterans, and in particular the men and women who trained and served at the Sampson Air Force and Naval Base. Commander Tom Watt, USN (Ret.) will serve as Master of Ceremonies at the official dedication ceremony for the Sampson Veterans Memorial Cemetery on July 30th. In addition to his 20 years of service to our Nation including a year of duty in the Arabian Gulf, Mr. Watt is the Supervisor of Sampson State Park. to serve as Master of Ceremonies on this momentous day for our servicemen and women." As Master of Ceremonies, Mr. Watt will preside over the dedication ceremony and introduce featured speakers, including keynote speaker Rear Admiral Richard West, USN (Ret. ), a distinguished and accomplished naval veteran whose 38-year military career has encompassed a wide range of operational experience, high-level assignments, and leadership positions. 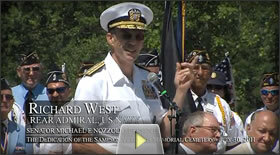 Admiral West has deep roots to the Sampson Naval Base and the Finger Lakes Region. He was born while his father, World War II Navy veteran Dana L. West was serving as a Recruit Company Commander at the former Sampson Naval Base. Dana West will be one of the first servicemen to be buried at the cemetery. the park and the cemetery are located on the site the former Sampson Naval and Air Force Base, where over a million sailors and airmen trained in preparation for battle to defend our Nation. The Sampson base served as a naval training station during World War II and was later used as an Air Force Basic Training Center. The Veterans' Cemetery is also a short distance from Waterloo, New York, the Nationally-recognized birthplace of Memorial Day. A genuine naval hero with deep roots to the Sampson Naval Base and the Finger Lakes Region will be the featured speaker at the dedication ceremony for the Sampson Veterans Memorial Cemetery on July 30th. 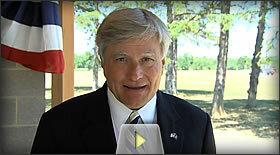 Rear Admiral Richard West, USN (Ret. ), is a distinguished and accomplished naval veteran, whose career has encompassed a wide range of operational experience, high-level assignments, and leadership positions. Richard WestAdmiral West has a unique personal connection to the Sampson Veterans Memorial Cemetery. He was born while his father, Dana L. West was stationed at the former Sampson Naval Base, where the cemetery is now located, as a Recruit Company Commander in the U.S. Navy. Dana West would serve in World War II aboard the Navy destroyer U.S.S. Gyatt. He went on to an accomplished career as a coach, teacher, mentor and later, principal to the students of the Port Byron School District. In 1999, Port Byron named its new school building Dana L. West High School in his honor. He will now be one of the first servicemen to be buried at the Sampson Veterans Memorial Cemetery. 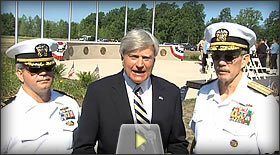 "I can think of no one more fitting to deliver the keynote address at the cemetery's dedication than Admiral Richard West, who has proudly followed in his family tradition of courageous service to our Nation and to our community," said Senator Nozzolio. "His outstanding leadership, knowledge and experience has been invaluable in reaching this important milestone in the creation of the Sampson Veterans Memorial Cemetery. It is a tremendous honor that Admiral West will be joining us on this momentous day for our servicemen and women." address, which will surely be a moving tribute to the dedication and sacrifice of our Nation's veterans." Growing up in Port Byron, New York and graduating from the University of Rochester, Admiral West has strong ties to the Finger Lakes Region. His highly accomplished 38-year military career began when he joined the Navy in 1965, serving as a Surface Warfare Officer. Admiral West served in the Vietnam War with the Riverine Forces, a joint U.S. Army and Navy force that carried out strike and patrol operations along the Mekong Delta. He would go on to three tours of duty in the Pentagon. He also served on several ships and was Commanding Officer of three, two during hostilities in the Persian Gulf. 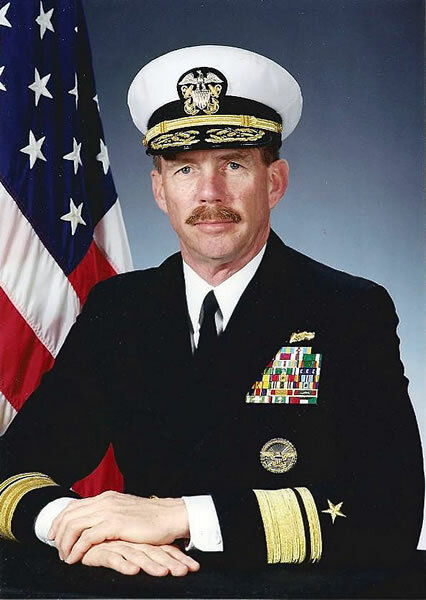 Richard West was appointed Commanding Officer of the Navy Surface Warfare Officers School in Newport, Rhode Island and was selected for Admiral while serving there. For three years, he served as Oceanographer and Navigator of the Navy where he managed a multi- million dollar program providing navigation support for the U.S. Navy and led the Navy's transition to electronic navigation. After retiring from the Navy, Admiral West served as President and CEO of the Consortium for Oceanographic Research and Education (CORE), an association of 74 of the country's leading oceanographic research institutions, universities, and laboratories. In his leadership position at CORE, Admiral West testified several times before the U.S. Congress and addressed the United Nations on Safety of Life at Sea. After years of work and planning, the Sampson Veterans Memorial Cemetery will officially open in less than 30 days. On Saturday, July 30th, New York State Senator Michael Nozzolio, Assemblyman Brian Kolb and Seneca County Board of Supervisors Chairman Chuck Lafler will join with area veterans, leaders of local, statewide and national veterans organizations, current and past members of the military, local, state and federal elected officials, community leaders, members of the Seneca County Industrial Development Agency/Economic Development Corporation and members of the Seneca County Board of Supervisors to dedicate the Sampson Veterans Memorial Cemetery in a ceremony beginning at 11:00 in the morning. The ceremony will feature a “Wall of Honor” paying tribute to the more than 60 veterans who will be the first veterans laid to rest at the memorial cemetery. The wall will include photographs and personal stories of each veteran’s courageous service to our Nation. The Seneca County Industrial Development Agency/Economic Development Corporation (IDA/EDC) has contracted with Seneca County to oversee and manage the day to day operations of the cemetery. The IDA/EDC will also work in conjunction with Sampson Veterans Memorial Cemetery Committee to secure both public and private support for cemetery, as well as the Sampson Veterans Memorial Cemetery Association to help manage the operational needs. “Many should be thanked for their significant contributions to this project. Deserving special thanks should be the Seneca County IDA/EDC, the Sampson Veterans Memorial Cemetery Association, as well as the members of their committees and the many veterans who have worked to make this final resting place--- in the shadow of Waterloo, the nationally recognized Birthplace of Memorial Day--- a reality for our Nation's veterans. We have overcome a great many obstacles and worked together with Seneca County officials, to finally reach our objective in creating the Sampson Veterans Memorial Cemetery,” said Senator Nozzolio. answered the call of duty, and served their Nation with honor and dignity. As the former Naval and Air Force base where over a million sailors and airmen were trained in preparation for battle, Sampson is unique and hallowed ground. Constructed in 1942 on the shores of Seneca Lake, the base is named after Rear Admiral William T. Sampson, a hero of the Battle of Santiago in the Spanish American War who was born in Wayne County. The Sampson base served as a naval training station during World War II and was later used as an Air Force Basic Training Center. The Veterans’ Cemetery is also a short distance from Waterloo, New York, the Nationally-recognized birthplace of Memorial Day. All honorably discharged veterans, their spouses and dependent children will be eligible for burial at the Sampson Veterans Memorial Cemetery. The guidelines for the cemetery will be based on national federal veteran cemetery standards. There are about 200,000 veterans living in the Finger Lakes region. The dedication ceremony will be located at the Sampson Veterans' Memorial Cemetery, just south of Sampson State Park along Route 96A in Romulus. That portion of Route 96A has been officially renamed the “Sampson Veterans Memorial Highway” to further memorialize all veterans, and in particular the men and women who trained and served at the Sampson Air Force and Naval Base. To learn more about the Sampson Veterans Memorial Cemetery, you can also go to the cemetery’s Facebook page. The opening and dedication ceremony date for the opening of the Sampson Veterans Memorial Cemetery is set for July 30th at 11am. The May 21st date is canceled. Senator Nozzolio's office is coordinating the opening day event. There is still no date set for the first burials. The Seneca County Board of Supervisors Finance and Public Works committees are currently working with the total board and the County Manager to resolve this matter. The Sampson Veterans Memorial Cemetery Committee is also working with the County and their committees to move this matter along. Senator Nozzolio has set up a new blue-ribbon fund-raising committee to raise funds for the operation and maintenance of the Veterans Cemetery. Committee member names have not been released, yet. I am very sorry that things are moving along slowly, but we have been reassured that the County is working very hard to resolve the situation and get burials started as soon as possible. three weeks. The main entrance is almost finished, the upper half of the old guard shack has been removed and materials have been ordered to start construction on the renovation of the guard shack. The foundation has been poured for the outside committal shelter. Almost, if not all the flag post have been installed and work on the renovation of the three-bay firehouse has started … this includes a new roof, windows, fire hose drying tower repaired and new doors. Area Veterans are going to build the new bathrooms in the firehouse. This has been done with the donations the Veterans Committee has received from individuals and Veterans organizations like VFW's, American Legion posts and DAV Post, etc. The first phase of road work is complete and parking areas and sidewalks are in place. At this time we are looking for the last construction phase to be completed around the first of August. The Veterans Committee is working very hard with the County to get burials started. I will keep site updated. On Saturday, October 23rd at 12:00 noon, Senator Mike Nozzolio will unveil the new road signs for Route 96A. The new name of the road will be Sampson Veterans Memorial Highway. The ceremony will take place at the Entrance to the new Veterans Cemetery which is 2 miles south of the Sampson State park on 96A. Also attending will be the American Legion National Commander. A special thanks to Don Linborg, Vice President of the Sampson Veterans Memorial Cemetery Committiee, who had the idea to rename 96A, took it to the Seneca County board of Supervisors, who approved the resolution, and sent it on to State where it was approved by the Assembly and Senate. The Sampson Veterans Memorial Cemetery is pleased to announce, construction will resume at the Cemetery site starting on August 30th. With the hard work of New York State Senator Mike Nozzolio, Assemblymen Brian Kolb, Seneca County Manager Suzanne Sinclair and the Seneca County Legislators we received the contracts for the grant awards, they have been signed and returned to New York State. the dedication ceremony of the renaming of part of route 96A to the Sampson Veterans Memorial Highway. Another note, the Sampson Air Force Veterans group will be holding their reunion September 9th thru 12th, 2010, programs will beheld at the Holiday Inn in Waterloo and at the Air Force museum and the former Sampson Air Force and Navy training site, now the Sampson State Park site. the Guard Shack, layout and build the burial areas, the outside committal shelter, the main flag area, and rest rooms and part of the Memorial walk area and roads. After this money is gone, we are going to have to rely on donations from organizations, veteran groups, companies, the State, and individuals. This money will be used for the daily operation and up keep of the cemetery. We will apply to our State Senators, Assemblymen and both US Senators and Congressmen for grants, stimuli packages, etc. Until the National VA Cemetery in Bath NY closes (around 5 years or so) the VA will not help us financially, they will provide all the benefits to the Veterans, headstone, flag etc. and will recognize Sampson as a Veterans Cemetery. We will build a Veterans Cemetery that the Veteran and his or her family will be proud of. I regret to announce that because of the State of New York's budget problems; we will not meet our expected opening date for burial of our first veteran at Sampson Veterans Memorial Cemetery in Oct. of this year. We don't expect to receive our grant money until after the budget has passed. New York State Senator Nozzolio, Seneca County's Manager, and the Seneca County Legislators have also been working to get the money released, but they have not been successful. Bids were collected for construction of the main entrance, guard shack, VFW memorial flag pole area and outdoor committal shelter area and were awarded to the lowest bidder. Bids also were collected for road construction, electrical, plumbing, rest rooms etc. and this bid was awarded. winter. 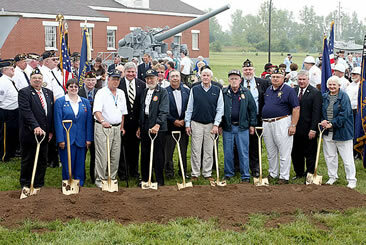 I want to assure the Veterans, their families, and every person or organization that has donated to the Cemetery that this project will be completed and we expect to have an opening day program and our first veteran's burial in late May or early June of 2011. With the support of the Seneca County Legislators, New York State Senator Nozzolio, New York State Assemblyman Kolb, the road known as Route 96A, which runs South from Routes 5 and 20 past the Sampson Naval and Air Force training center and the new Sampson Veterans Memorial Cemetery to Ovid, N.Y. will be renamed the Sampson Veterans Memorial Highway. We are looking for a dedication program to rename the route sometime before November of this year, I will keep this site posted. I would like to say on behalf of the Cemetery Committee to all the Veterans families that are waiting for their loved one to be interred at Sampson how sorry we are that we will not meet our October date to open, but be assured this Cemetery will be built. Bids are expected to go out in next three to four weeks, for the laying out of the cemetery, Main Gate, Three Bay Fire House, Guard shack and roads. If everything goes right and the weather is on our side, we hope to inter our first veteran sometime around the last two weeks of October or first part of November. Police and the Seneca County Sheriffs' Office will be patrolling the site on a regular basis after hours. On April 19th at 1:30 pm, there will be a Veterans Update meeting for all veterans at the Seneca County Office Building in Waterloo, N.Y. on the second floor. Any veteran or their family members are welcome to attend. On Saturday May 1st, Cindy Campbell, her husband, Wayne, and their fundraising committee will hold a chicken BBQ from 11:00 am to 4:00pm at Wal-Mart in Waterloo, N.Y.
Dan Motell, of Ovid, is in the process of setting up a golf tournament on May 22, 2010 at the Big Oak Golf Course, there are still a couple of foursomes still open. We have blue Sampson Veterans Memorial Cemetery wrist bands on sale as a fundraiser. Doris Wolf is heading up the committees for the first small open of the Cemetery in mid October or early November and is also heading up the committee for the main opening in May of 2011. The Sampson Veterans Memorial Cemetery is moving right along and is close to schedule. Six buildings have been demolished and the remaining five will be closed up for safety and the winter months. This will be completed by January 2010. The bid for clearing (grubbing) of the 28 acres for phase one of the Cemetery was awarded and this also will begin in the next week or so. The bids for the architecture and engineering firms, for the three bay fire house, guard shack, main entrance, roads, memorial walk, main flag pole area, parking area and the burial sites will be awarded in the next week or so. The committee wants the three bay fire house and guard shack to be rebuilt as close to original as possible. The guard shack will house the computer for grave site locations and information about the cemetery and cemetery sites. The fire house will be the main chapel, rest rooms, offices and changing rooms for the honor guards. A decision for the remaining three buildings will be made in the future. There are plans for an outside committal shelter so we can have services outside during the summer months or have two services at one time. Bids will go out for construction of the fire house and guard shack and layout out of the cemetery as soon as blue prints are finalized, and construction will begin as soon as the weather allows in the spring. We hope to inter our first veteran in October or November of 2010. Cindy Campbell of Waterloo, N.Y. has volunteered to accept the position of fund raising chairman. If anyone would like to be on her committee, please call me at my home (315-568-4155). This is going to be a very important part of the operation of the cemetery, because after the State money is spent to build the first phase of the cemetery, we will need donations to operate the cemetery and stay within the VA requirements to remain a Veterans Cemetery. There is a well on the site and it will meet our water requirements. We would like to thank ITT Water Systems of Seneca Falls and George Stralley and his staff for the donation of a new well pump and pressure tank and to Barney Moravec Water Well Company of Penn Yan, NY for donating his staff and equipment to install the new pump, this was completed in November. A thank you to the Waterloo water department for testing the water to insure we met the requirements. The committee has been in contact with the Veterans Administration in Washington and provided with all information pertaining to the cemetery and they have responded. We know that the Bath National Veterans Cemetery will be full in the next four to five years and what an honor it would be if the Veterans Administration took over Sampson. This is our main goal after the first phase is built. Sampson is in central New York, and after the Bath National cemetery, the closest Veterans National cemetery is in Saratoga, NY near Albany. The other National Cemetery is in Long Island NY. Sampson is a Veterans cemetery. We will inter any veteran (meeting the VA requirements) from anywhere and their spouse. We will follow the Veterans National Cemetery guidelines and criteria. We are not part of any other cemetery, and Sampson is not part of any State or County cemeteries. Sampson will be maintained by a Veterans non-profit committee. If the weather next year (2010) is in our favor and New York State doesn’t hold up our grant money again, we will meet our goal of opening up The Sampson Veterans Memorial Cemetery in October or November of 2010. We will be forming a dedication committee and would like to have a dedication ceremony sometime in May or June of 2011. If anyone would like to serve on this committee, as always, feel free to call me at my home anytime. The bid for the demolition of six buildings on the former hospital site and present Sampson Veterans Memorial Cemetery site, has been awarded to Diversified Construction Services Inc. of Phoenix N.Y. and work should begin with in the month. Many people have put forth both monetary donations and merchandise donations to assist SVMC. Over 20 veterans attended the update meeting of Sampson Cemetery. The thrid update meeting will be held in early November - date, time and location to be announced later. On Tues. Aug 18th at 1pm at the Seneca County Office Building 2nd floor. There will be new information on the beginning construction of the Sampson Veteran Memorial Cemetery. All Veterans are invited to attend. Tell our Veteran’s and Active Military they are not forgotten! Purchase a heart or star for $1 or a flag w/banner for $5 in honor or memory of a loved one. As soon as Governor Paterson releases the state grants, we will put out bids to start building the cemetery. Currently we are looking at finishing the project for opening in Summer 2010. The design firm, project engineer firm and the fundraising firm are all in place. There is some work to be done on the roof shingles of the three buildings we are keeping; the Bay Fire House, the old Guard Shack, and the Four Cell Brig. When those are completed the remaining buildings will be torn down. The resolution to rename Route 96A to the Sampson Veterans Memorial Highway was presented to the Seneca County Legislators by Mitch Rowe, Jason McCormack and the Seneca County Manager Suzanne Sinclair. The resolution passed and now will be sent on to the state. Thank you, our County Committee members and the legislators. The "Future Site" sign has been put in place at the entrance of the cemetery. Tom Shayler of "Sign Guy" in Auburn, N.Y. designed and painted the sign. Roy Gates and his crew at the Seneca County Highway Department installed the sign on Wednesday, April 29th. Thank you, Roy and crew. I am sure everybody who sees the sign are going to be very pleased. Thank as well to Tom Shayler and your employees. The new logo and brochure have been added to our fundraising site. Both were designed by the firm, Christopher Communication, out of Rochester, NY. Christiane Christopher and her employees did a great job on both. Thank you, Christiane. March 31st at 2pm in the Seneca County Office Building on the second floor there will be an update meeting for veterans concerned with the Sampson Veterans Memorial Cemetery project. Bids will be going out for construction by early April. STATE GRANTS — Apply for and accept grants of up to $3.9 million from the state for the planning, design and development of the initial phase of construction. The grants, secured by state Sen. Michael F. Nozzolio, R-54, of Fayette, will come from the state Dormitory Authority and the state Department of Transportation. MASTER PLAN — Adopt a master plan for the cemetery. A draft plan was submitted in January by the firm of Wendel Duchscherer of Buffalo. That plan has been modified to reflect public comment and is being adopted as the final master plan. CONSTRUCTION MANAGER — Hire Lu Engineering of Penfield to serve as construction manager of the cemetery at a cost not to exceed $228,500. The work will not begin until a notice to proceed is issued by the county. ENGINEERING AND DESIGN — Hire Wendel Duchscherer for engineering and design services for Phase 1 of the cemetery project at a cost not to exceed $309,500. Again, that work will not begin until the county issues a notice to proceed. MARKETING — Authorize seeking proposals from qualified firms for marketing, public relations and development services for the cemetery project. The plan is to spend an estimated $5,000 from privately raised funds for the cemetery, held in trust by the county, to pay for that service. Please join me on Saturday, September 6th for the official groundbreaking ceremony for the Sampson Veterans Memorial Cemetery. Time: 12 Noon A reception with light refreshments will immediately follow the groundbreaking. Please RSVP by calling 1-888-568-9816 or by e-mail.